Jenny and Tabitha weren't the only local designers I did website work for. Christine Ng-Nickerson--whom I met while covering the 4th Ave grand opening for Stylefinds--approached me about doing some website work in exchange for jewelry from her Howling Dog line. It wasn't until the Monday before I left that I found the time to drop by her home and pick out my payment swag. 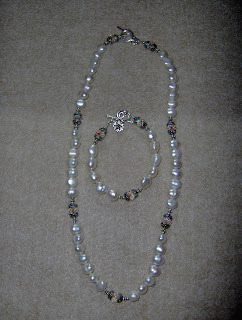 With a penchant for pearls on my mind, I chose a necklace and bracelet made of white freshwater pearls, silver beads, and Swarovski crystals. I couldn't stop playing with my new jewelry once I got home. Christine sizes her bracelets using her own small wrists as a standard, which I love because I have very small wrists as well and bracelets fall off all the time. This one actually stays on! I'm thrilled. Further experimentation yielded the fact that I'd gotten 3 pieces of jewelry in 2. 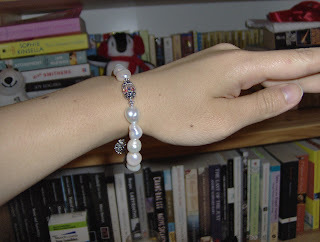 I slid the toggle on the bracelet through the loop on the necklace and vice versa, and voila! 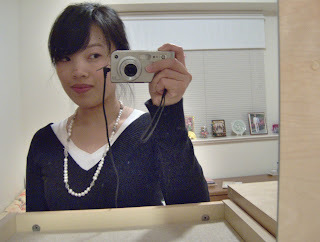 I had a long statement necklace. Coco Chanel, eat your heart out. Wow, pretty jewelry! I actually have slightly larger wrists so end up with the opposite problem.